Branding of Logos and Gaphics of All Types. High Quality and Interior and Exterior Durability. 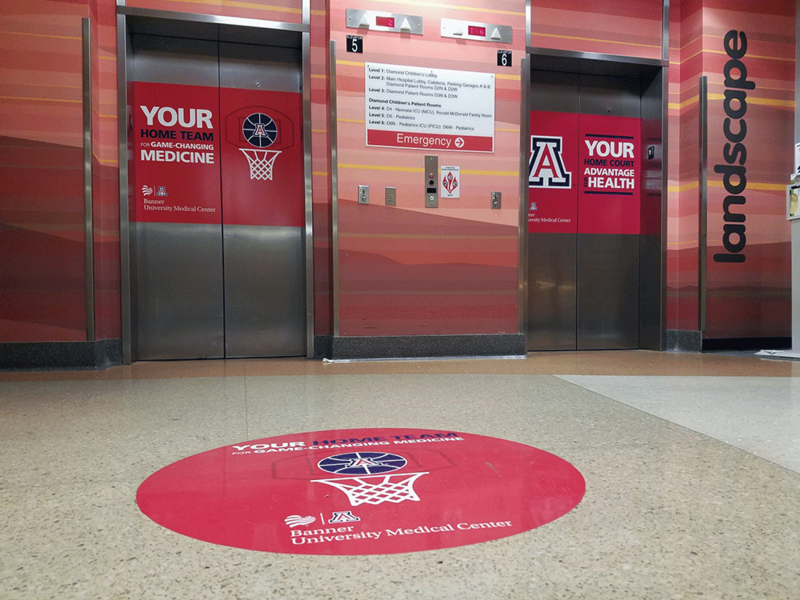 This project by Graphic Impact for Banner University Health was to take advantage of a sponsorship branding the ospital with the University of Arizona. We took advantage of both elevator door surfaces and floor decals. If the surface of your floors are smooth, we have a special product which consists of vinyl with special properties for digital prints. The colors are extremely vivid and durable. The second phase of the installation is a laminate with a proven non-skid finish. The process has been used in supermarkets, hospital floors and even concrete sidewalks for branding and value statements. Graphic Impact also has a variety of special products for walls (some with a texture and other flat) and solutions for metal and plastic surfaces.